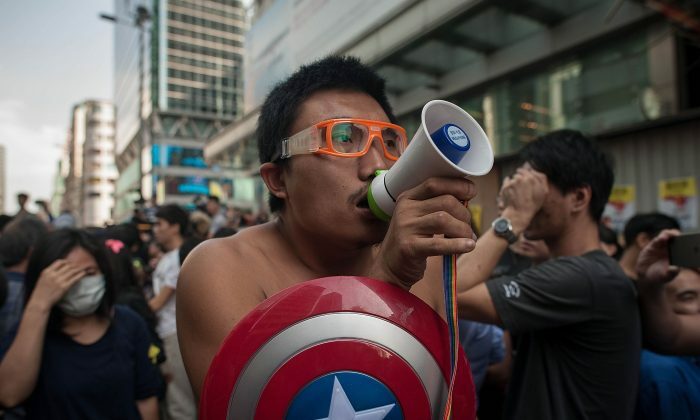 HK People: 'Captain America' Pleads Not Guilty; Eric the Artist Arrested? 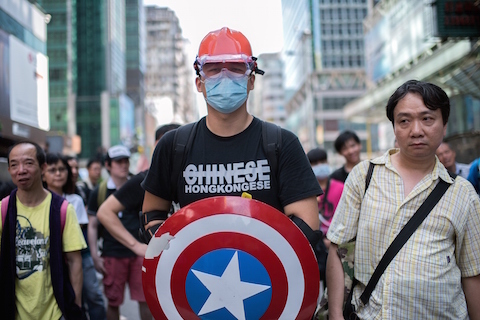 HK People: ‘Captain America’ Pleads Not Guilty; Eric the Artist Arrested? Eric the Artist returned to Mong Kok for more “shopping” action on Saturday, Dec. 20. Apparently, he was detained for a stretch and let off without having to post bail. Here’s a quick follow up on two of the Umbrella Movement’s more colorful characters. On Friday, Dec. 19, Hong Kong’s “Captain America” was charged in court on two counts of common assault and pleaded not guilty, Hong Kong publication Apple Daily reports. “Cap’,” who’s real name is Yung Wai Yip, was arrested in the Mong Kok shopping district for allegedly shoving an anti-Occupy protester with his shield on Oct. 24, and again on Nov. 3 for restraining another anti-Occupier. Yung’s Captain America shield was taken from him after the first arrest. Both anti-Occupy protesters were removing plastic cable ties that Occupy protesters used to bind their makeshift barricades when “Captain America” stepped in. Yung claimed he was merely trying to “dissuade” the anti-Occupiers in both incidents. The court said that a judgement will be passed Jan. 30, 2015, set HKD $4000 ($516) bail, and barred the 31-year-old lifeguard from entering a large segment of Mong Kok. Meanwhile, Eric the Shirtless Graffiti Artist might have finally been nabbed by the police. At about 11:25 p.m. local time (10:25 a.m. Eastern Standard time), Eric, dressed in jacket and pants this time, was led away by a group of police officers in Mong Kok after refusing to show his identification. Earlier, he was engaged in heated conversation with them. It is unclear if Eric is being detained by the police, or if he was just escorted away. After all, Eric did literally slip out of police hands at least once. Eric was a regular Umbrella protester in Mong Kok, and often goes about shirtless (even when temperatures dropped to the fifty degree range), hence his nick name. He also spots a pair of orange goggles and uses a mini-megaphone to broadcast pro-democracy slogans and rants about the police and the Hong Kong government. In an interview with the New York Times, Eric says that he joined the Umbrella protests after seeing police tear gas the pro-democracy crowds in Admiralty on Sept. 28. “I have a dream,” he said.